What is Digital Device Provision? Digital Device Provision, also referred to as DDP, is the supply of school-issued digital devices to all Senior and Sixth Form pupils. We plan to supply devices over a 15 month period starting with Year 7, 9, 10 and 12 (current Year 6, 8, 9 and 11) from June to September 2019 and then supplying Year 7, 9 and 12 (current Year 5, 7 and 10) from June to September 2020. As a School, our core mission is to prepare young people for the world in which they will live, study and work. Educational research shows that putting students at the heart of their own learning helps develop strong metacognition, and digital tools enhance enquiry, collaboration, organisation and self-direction. Students value the opportunity to develop these skills, and will benefit in their future lives from a strong blend of digital and analogue literacies. At Berkhamsted, we believe that digital devices have an important part to play in creating engaging lessons in the classroom. We also aim for students’ learning beyond the School gates to be as rich and intellectually stimulating as possible; capitalising on the interactivity and immediacy of our suite of tools. Student devices will allow for a more seamless learning experience between School and home. We believe in the importance of a balance of activities in lesson planning, which can include both offline and online activities. Our focus will always be on aiming for excellent teaching and learning, and how digital learning can enhance that in line with our curriculum and BLP dispositions. We want to give our pupils the life skills and understanding to be ahead of others in terms of employability and optimum working practices, and recognise that technology will play an important role in this. Pupils at Berkhamsted need to leave the School confident that they can safely navigate the wider world in which they live and will work. Universities and businesses are expecting students and employees to be digitally literate and have a high awareness of their personal digital footprint. According to Microsoft, “Within the next two decades, 90% of jobs will require some level of digital proficiency.” Creating strong digital working habits will support Berkhamsted students in their future professional journeys. Not necessarily. Our vision is for Berkhamsted pupils and teachers to use technology in a blended learning environment; complementing existing teaching styles by using devices to enhance, and in some cases transform, pupils’ learning experiences. We continue to value the importance of ensuring that all our pupils, without exception, are able to read and write fluently and are fully numerate. We see mobile technology as an additional tool to enhance opportunities for pupils to excel, and it is more important to reflect qualitatively on usage in terms of learning outcomes and progress where technology has facilitated good work, rather than tallying up lessons or hours. Will DDP mean that we stop using hard copies of text books and paper resources? Nationally more and more teachers are reducing their usage of textbooks, and are using online resources instead. DDP will offer more flexibility for combining digital resources, including subscription resources, online materials from the web and electronic versions of textbooks. In addition, DDP will mean that departments can reduce the use of paper and exercise books in favour of digital work where it best suits the needs of teachers and learners. Initially, this will vary between subjects and Year groups, and will develop as the School community becomes more skilled and develops robust habits for digital learning. Through training, teachers will explore worked examples of planning which seek to understanding the pros and cons of the choices available: e.g. precision diagram drawing, annotating documents, mental maths, redrafting written pieces, illustrating work, and gathering research. In practical terms, departments will establish for Senior and Sixth students where their work ‘lives’. If students complete offline / handwritten work, it can be photographed and stored with digital work so that everything is kept online, and students can reduce the amount of ‘lost learning’ from lessons which currently goes uncaptured or recorded. How will DDP impact on the management of pupil behaviour? We will make school-wide expectations of behaviour clear to staff as part of our internal process and to students when DDP is launched, including managing off-task behaviours. We are also investigating software that will allow teachers to monitor pupil use, as well as considering arrangement of classroom furniture. Wireless connection for teacher devices means that teachers are not obliged to teach from the front of the room, and can circulate actively amongst students to monitor their work. Does limited screen size represent a challenge in terms of learning and productivity? Screen size is relatively small so some flexibility about switching between active windows and working with multiple online resources is needed. Whilst this may be frustrating initially for some learners; we know that they are usually agile users of multiple apps on their phones, and can transfer this skillset to their schoolwork. Teachers can explore how best to deliver resources to them in a responsive and coherent way through tools such as OneNote and Firefly. How important is typing speed? Improving students’ typing speed will become a more significant priority in Year 7. We already teach approximately 4-5 lessons in Years 7 and 8 ICT with brief revisit in Year 9. We subscribe to an online course to support students’ progress, and assess typing speed annually. It will be important to boost typing skills further, as slow keyboard use (less than 25 wpm) may be an obstacle to progress. Nonetheless, we are also keen to highlight that the Surface device pen is a powerful inking tool and students can also handwrite on the Surface very effectively. How does DDP align with our School Digital Wellbeing Framework and School Wellbeing Strategy? The Digital Wellbeing Framework has proved successful in improving mobile phone usage and creating a better atmosphere in School. Therefore, in the first year, we will maintain the current zones and apply the same rules to Surface devices as to mobile phones. Some reflection will be needed about Nash Harris Dining Hall with regard to the 6th Form. We will review the DWF in the latter part of Year 1 to reframe it for the start of Year 2, taking into account the fact that no student should need to use their mobile phone for learning once Year 2 has begun. In terms of physical wellbeing, it is important that we educate staff and students on the importance of posture and eye health. There is a lot of debate in the research community about the real effects of screens on mental health and sleep, so we advocate for balanced and blended learning experiences which do not depend on screens 100% of the time, without setting arbitrary time limits. The Device, Who and When? The provision of the device will be included in the general fees, although we will be asking for a contribution towards the cost of the device in the region of £60-80 per child per term. We have concluded, through research, that a school-issued protective case/cover is likely to be rejected by pupils due to lack of choice and customisation and therefore we will be asking parents to purchase a protective case/cover of your choosing. Rugged cases are highly recommended and start from £30. Specification and recommended models will be published closer the time. What devices will you be issuing? 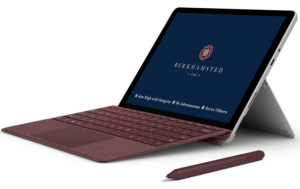 After years of research looking into different schemes and roll-out models, in particular similarly sized independent schools, we have chosen the Microsoft Surface as the device of choice to supply to pupils. The Microsoft Surface is a hybrid tablet that lends itself well to the education environment where a device with a variety of applications is required, including a stylus to write with. When will my child get their device? We will be issuing devices before the new academic year begins to Years 7, 9, 10 and 12 (Sept 2019 intake). For current Year 6 pupils moving up / joining in Sept 2019 devices will be available from late June 2019. Devices for pupils moving up / joining Year 9, 10 and 12 will be available from July 2019. Each device will need setting up by the pupil. Families will be given the choice to take the device ‘out of the box’ and with instructions set up the device at home. Alternatively, we will be running sessions throughout the summer break to issue devices to pupils in a training environment. The following images indicate the device replacement timelines for year groups moving up / joining in Sept 2019. Why can’t my child use the device they already have? Our research has discovered that 1:1 schemes that use devices not owned, but more importantly not managed by the school can be problematic for a number of reasons, in particular around classroom management. Standardisation of hardware and software is an important factor to ensure that lessons with devices run smoothly because the school can guarantee compatibility. What happens if the device is lost, damaged or stolen? Every device is covered for accidental damage and theft. A procedure will be in place for a replacement device to be provided. An excess of £50 will be chargeable for each claim. Will my child be able to charge their device at school? 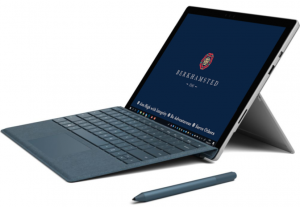 The Microsoft Surface has a very reasonable battery life and we expect that with good power management, a fully charged device will last a full school day. Pupils may not always remember to charge their device at home, and for those occasions there will be provision for charging in house rooms and in lessons. Will the school be providing support? Support of the device is one of reasons why we didn't entertain a bring-you-own-device scheme. By supplying a school-issued and managed device means we can provide an excellent level of support. All pupils will have access to the IT drop-in centres at Kings and Castle campuses between 8am-5pm Monday to Friday. Help and advice on Office 365 and best practices will be covered in ICT lessons for Y7-9. Will the device be protected against viruses and malware? Yes. Windows defender will be installed on every device to protect from viruses and malicious software. In addition to this internet filtering software will be installed to reduce the risk of accessing websites that are at the source of such material. Can my child access inappropriate content on the device? All devices will have internet filtering and safeguarding software to prevent access to inappropriate content. This does not negate parents setting clear boundaries and expectations for use at home in the same way as if it were their own computer. Will my child be less safe carrying their device to and from school? We know from our recent surveys of Berkhamsted pupils that a large number already carry expensive devices to and from school and so we believe that they are not under any greater threat. We will encourage pupils to follow standard precautions when travelling to and from school. Do I need Wi-Fi at home? Yes. The IT services and platforms that Berkhamsted provide are cloud based and therefore require internet access. Does my child still need access to a computer at home? No. The device provided will run the latest version of Windows and Microsoft Office. Other applications for specific subjects will also be available for pupils to download. As far as school work is concerned there will not be anything that they are expected to do digitally that can’t be done on their school issued device. In a majority of cases everything that they need/want to do outside of school work can also be done on the school-issued device.